Soon after news of a possible breakthrough in the contentious OROP issue emerged, the protesting army veterans have accused the government of maligning their image. 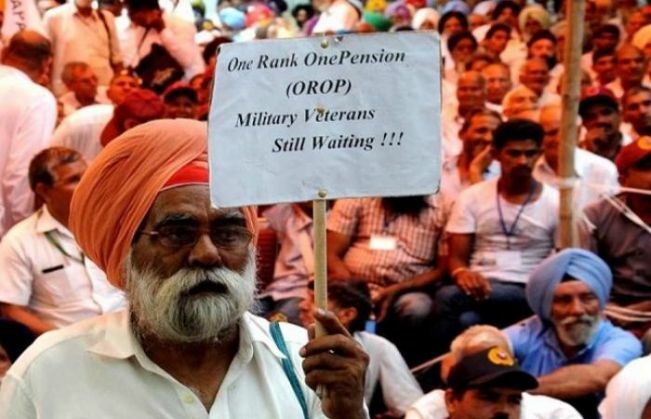 Early on 3 September, during a press conference at Jantar Mantar, the ex-servicemen said that they are not asking for a monthly increment in the pension, but seeking a periodic pension revision which should be termed as a demand or bonanza. The ex-servicemen on the 82nd day of their protest, also alleged that a lot of fake information has been leaked on the OROP issue which portrays the servicemen as greedy. The allegations came from the veterans after media reports suggested that a solution for the OROP agitation would be announced, before the dates of the Bihar elections were set. On 2 September, during the three-day coordination meeting, the Modi government was asked to expedite the implementation of the One Rank One Pension scheme, so that the hunger-strike by veterans could end. There have been reports floating around that say the veterans and government have shown flexibility and both camps have softened their stand. There's also talk of ex-servicemen willing to drop the annual review of the pension. Meanwhile, the Modi government has accepted the 2014 slab for assessment of pension.